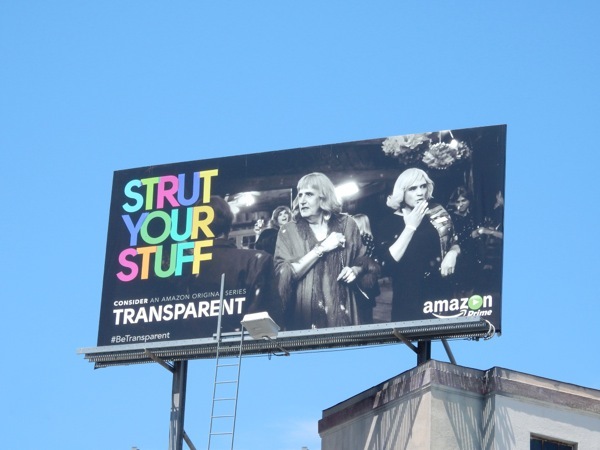 Once in a while there comes along a show which captures the spirit of the times we live in and Amazon's original scripted series, Transparent, is just such a show. Before Caitlyn Jenner was the latest transgender phenomena and after Orange is the New Black introduced us to the talents of Laverne Cox, Transparent told the personal tale of how an older retired father of an L.A. family admits to them that he'd always identified himself as a woman and was finally wanting to live his life openly. 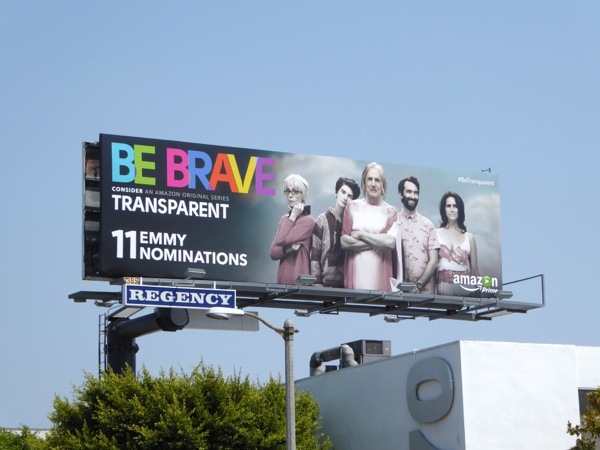 This clever Emmy campaign for the breakout series (which has already earned the show and its star Jeffrey Tambor a Golden Globe) highlights some of the personal moments from the comedy drama which made it resonate with so many people as they binge-watched the engrossing ten episodes. 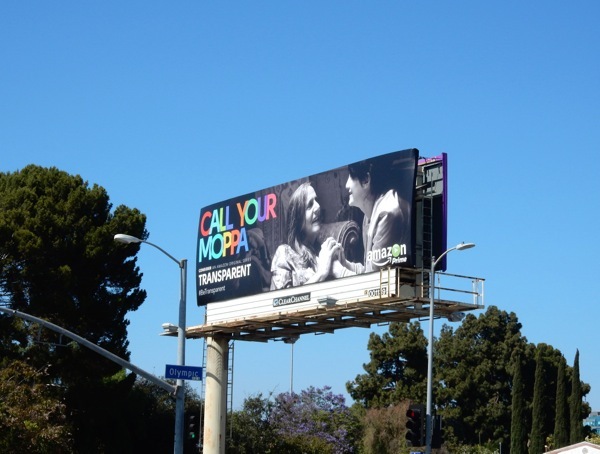 In fact it's one of Daily Billboard's favourite Emmy campaigns this year, especially as the black and white imagery combined with the multi-coloured fun copy really helps the billboards stand out. 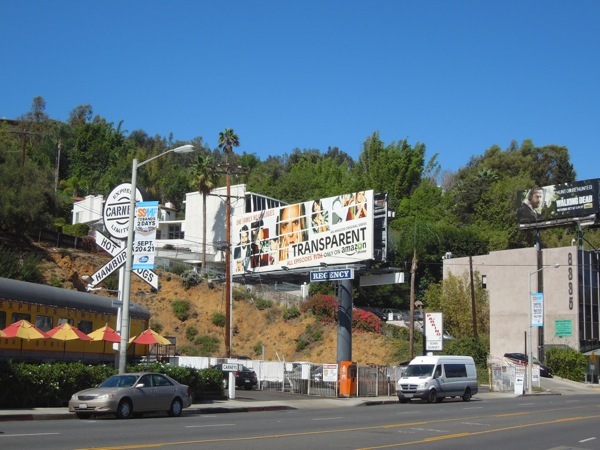 If you're a fan of the show, here's also the Transparent series premiere billboard snapped along Sunset Boulevard in West Hollywood back on September 15, 2014 (when it received far less outdoor support for its debut). 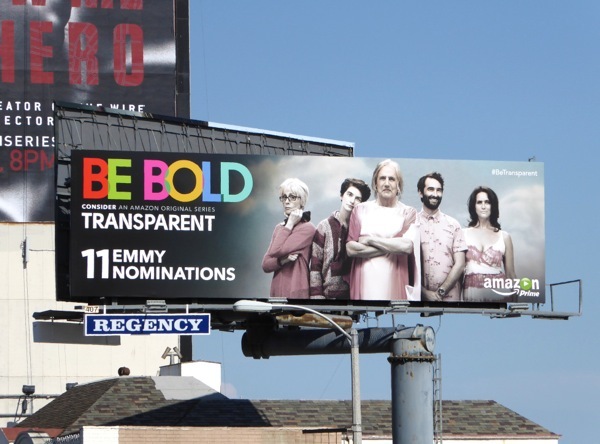 If you like these engaging ads, be sure to also check out this year's HBO Emmy consideration billboards for more shows up for recognition for excellence in the television industry. 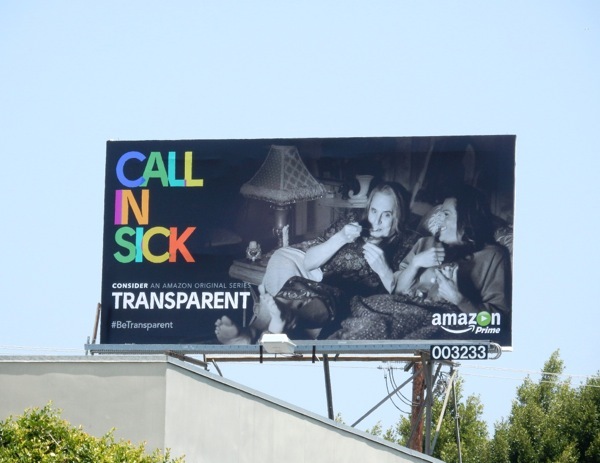 Plus take a look at this Mad Men 2014 Emmy campaign, which was Daily Billboard's favorite from last year with its mock 60's product adverts. 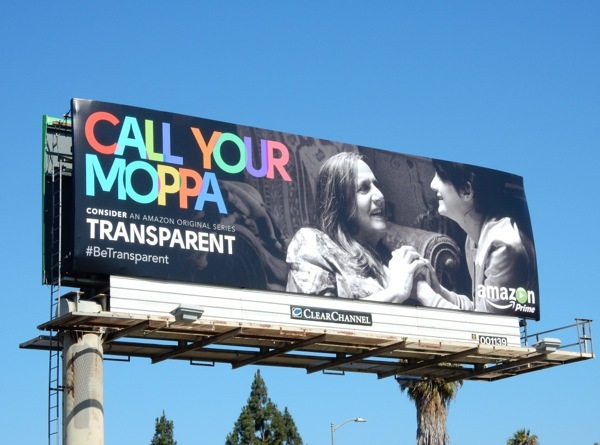 Transparent would certainly get Daily Billboard's vote, so fingers crossed for Emmy success and let's hope season two can continue the magical and enlightening viewing experience. 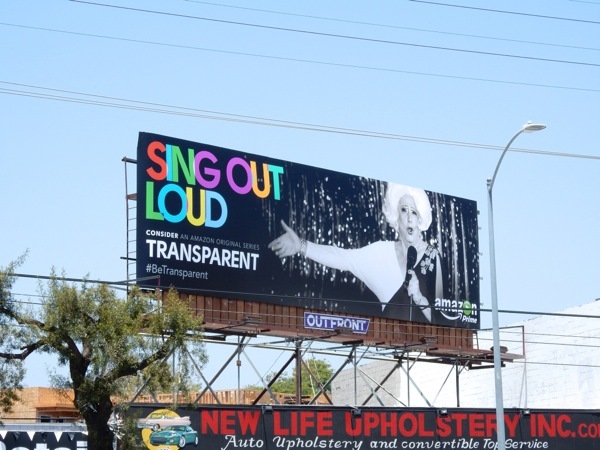 UPDATED: Here's another fun creative from the campaign which sees Maura and 'Marcy' (Bradley Whitford) strutting their stuff, snapped high above Wilcox Avenue in Hollywood on June 17, 2015. 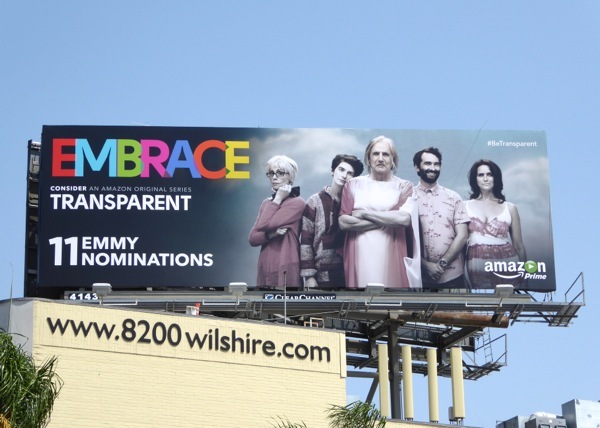 UPDATED: The fun Emmy consideration outdoor ad campaign must have worked for Transparent as the series has received eleven Emmy nominations and is back in the city skyline campaigning for the win. 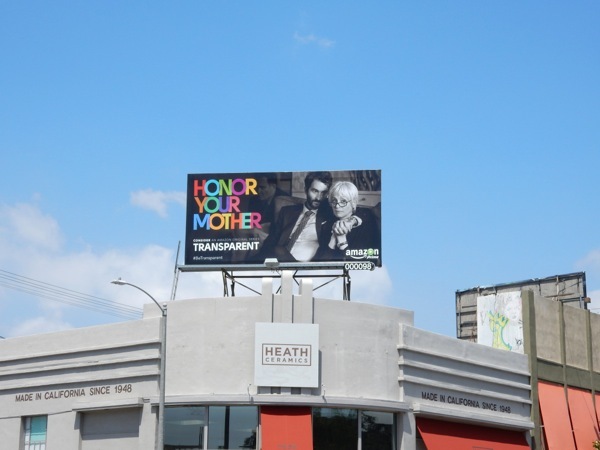 These proud nomination billboards featuring a family portrait of the dysfunctional Pfefferman family were snapped high above the busy Beverly Boulevard, Wilshire Boulevard and the Sunset Strip from August 13 to August 19, 2015. Let's hope by being brave and bold Amazon's critically-acclaimed show can embrace some coveted industry awards this September.